I first embarked upon this whole fatherless daughters movement when I sat down to write a book about me growing up without my father. That was 2012 and in 2013 Oprah Winfrey did a two part show with Iyanla Vanzant on Daddyless Daughters. The response to my book was overwhelming with women emailing me their stories. I literally received stories from all around the world. While we all never met, we connected because we shared a common pain. Once Oprah’s show aired, my inbox flooded. I even received an email from one lady who was featured on the show. I knew that I had to do more. There was so much pain being experienced in the hearts and souls of my dear sisters everywhere. I knew that pain all so well. So I started facilitating workshops using my processes and methods I used to heal my life. I couldn’t find any result driven information or content that specifically served fatherless women. So I developed one. My workshops became in such demand that I was not able to keep up. 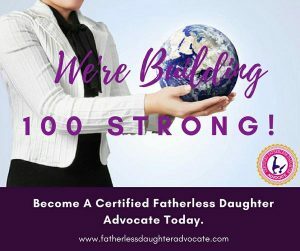 So I decided to create a train the trainer where I would certify fatherless daughter advocates to help with the work. This is how the Fatherless Daughters Network was born. We currently have advocates in 6 different countries and over 25 US states. I created an online Facebook community to serve as a safe and sacred space for women who shared a common pain could come together to share, connect and grow. Throughout my work, it’s never been my intention to blame, criticize or berate fathers. While I will never understand why some dads don’t show up for their children, I do know that something has fundamentally gone wrong in his life for him to do such painful acts. Now this does no excuse him or let him off the hook…but it does mean that he has his own story. When I stand in front of an audience to share my story, I rarely share what my father did or didn’t do. Because my father is not my story. The impact his behavior had on MY life is my story. You see, I was more concerned with being free, healed and happy than I was on blame. If I could identify the impact and find a way to heal it, then I knew my life could move in an entirely new direction. That’s exactly what I did. I took ownership of my life 100%. I focused more on the healing, than the hurt. This is my hope for all fatherless women. My life has not always been good. My first marriage failed due to lots of wrongdoings of my ex-husband…so I thought. Yet, as I began to do my work, I discovered some hidden, muted, unrecognizable patterns that I lived out in that relationship as well. You don’t know what you don’t know. But I needed to know so that I never did it again. I struggled in my relationships with love and money. My bank account and love tank both stayed on empty. The impact that fatherlessness had on my life was causing me pain in these areas. But focusing on my absent father would not help me. Focusing on the triggers, the belief systems that stemmed from my fatherlessness was what I did. I’ve been married to my second husband now for almost 16 years. It’s a wonderful relationship. Not perfect, but amazing. I’ve never been loved and cherished by a man the way my husband does for me. I also have been successful in my relationship with money. I no longer struggle for money. I share all of this not to impress you, but to impress upon you to make healing your fatherlessness a priority. It took me a long time to even admit I was a fatherless daughter. A lot of shame would surface for me. I didn’t even want to do this work because I didn’t want to be a poster child for fatherless daughters. But I now delight in this work. But I can only do so much alone. It was never meant to do alone. When I watch these negative fatherless patterns being played out on television, the news and social media among women, it breaks my heart. What I know for sure is that if we don’t stop blaming and take ownership in our healing journey, we will continue to experience broken or unhealthy relationships, money issues, health problems and more. I want to build an army, a huge network of fatherless women who will take the journey to healing and then turn around and teach others how to do the same. This is the mission of the fatherless daughter network. To train and certify thousands of women through our breakthrough, result driven program where they can come face to face with their own healing and be equipped with powerful and rich content to offer to others. This is our vision. And even if you never teach this content to others, you owe it to yourself to take this training. There’s not another program like this on the planet. Not one. I’ve witnessed women’s lives literally transform as a result of this amazing program. While I love reading your stories and I am grateful you trust this community to share it with, I never wanted you to stop there. I want you to move towards your healing and rewrite a new narrative for your life. Because infinite possibilities awaits you. We are not victims because our dads hurt us, we are only victims when we allow the hurt to remain and do nothing about it. This is about you and your journey. Will you take the journey? It’s definitely a journey worth taking.